Ukraine is fighting two wars: Its fight against corruption may matter as much as its battle with Russia. Russia isn’t the only threat. Kiev is also fighting a war against corruption. 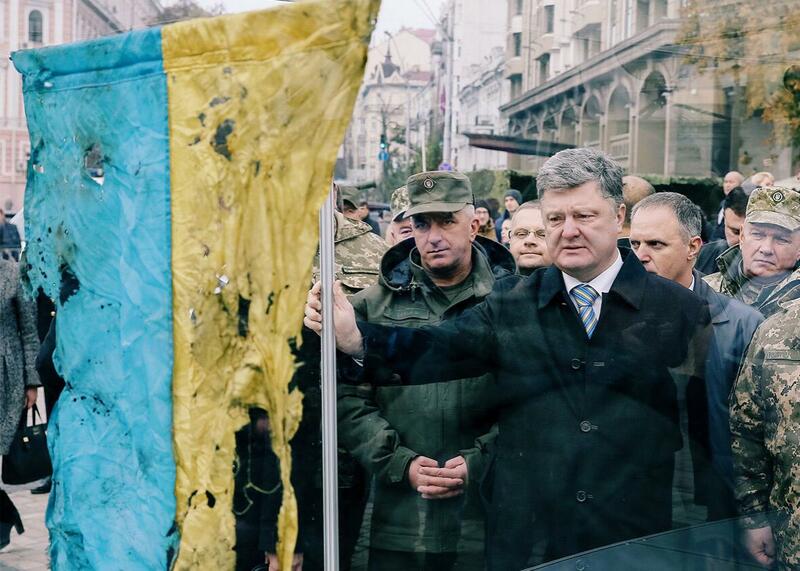 Ukrainian President Petro Poroshenko, center, looks at a Ukrainian flag brought from an eastern region of the country in Kiev, Ukraine, on Oct. 14, 2015. KIEV, Ukraine—A year ago, the only topic of conversation in Ukraine’s capital was the war. Did Russia want to take half the country or just a part of it? Would there be a full-scale invasion, and, if so, when would it start? Kiev today doesn’t feel like a city at war. Local elections were underway when I was there last week, and the city was plastered with posters. Politicians offering every conceivable opinion smiled benignly at pedestrians from billboards, kiosks, and bus stops. Across the country, more than 200,000 candidates from 132 parties had registered to contest seats in 10,700 local councils. Most of the voting went smoothly, though not all of the country could vote: Russian-backed “separatists” still occupy a chunk of eastern Ukraine. The promises Russia made in the Minsk agreement have not been fulfilled: Russia has not fully withdrawn its troops and weapons from Ukraine, and the border remains unsecured. Nevertheless, the Russians have turned—at least temporarily—from Ukraine to Syria, and thus the fighting has stopped. There is now a breathing space, and it is one that the Ukrainian government should use to fight its second war: the one against systemic corruption. In a real sense, the two battles are the same. Russia has long manipulated Ukrainian politics, both subtly and openly, buying politicians, corrupting gas deals, and perverting business. In 2006, I sat in a splendid gilded room with the Ukrainian president, Viktor Yushchenko, and listened as he told me that the Orange Revolution—Ukraine’s first attempt to throw off its corrupt leadership—was failing, thanks to Russian pressure, and why it wasn’t his fault. It sounds good—but no one I met thinks it’s sufficient. “These things are marginal,” another government official told me. “To most people it feels like nothing is happening at all.” For one, there isn’t an alternative bureaucracy to replace the current one, with its roots in the practices of the past. Worse, Ukraine’s state is so rotten that laws are not executed in any case. As Yatsenyuk himself points out, Ukraine has only just begun to reform its judiciary and independent prosecutors. He plans to fire all 9,000 judges, he says, and only rehire those with clean records—though it hasn’t happened yet. And a corrupt Cabinet minister was arrested but released after 48 hours. Despite the lustration law, at least some “fired” bureaucrats have re-emerged in new roles. The fight against corruption also requires cultural change, even moral change, and that can’t come only from the top. The mayor of Lviv, in western Ukraine, has forged a successful political movement around the idea that the war on corruption begins at the very lowest levels of local government. But elsewhere in the country, local elections were marred by voters selling their votes—a sure sign that cynicism begins at the bottom, too. Yatsenyuk agrees that he has made little progress in fighting “petty corruption, in hospitals, secondary schools, in the universities,” and of course this is the kind of corruption that touches most people. Higher public-sector wages would help, but that would require economic growth. And as long as investors of all kinds keep away from corrupt Ukraine, the economy won’t start moving either.